These are the voyages of the hand truck, Shacktopus. Her continuing mission… to seek out new loads and strange environments… to boldly blink where no one has blinked before. 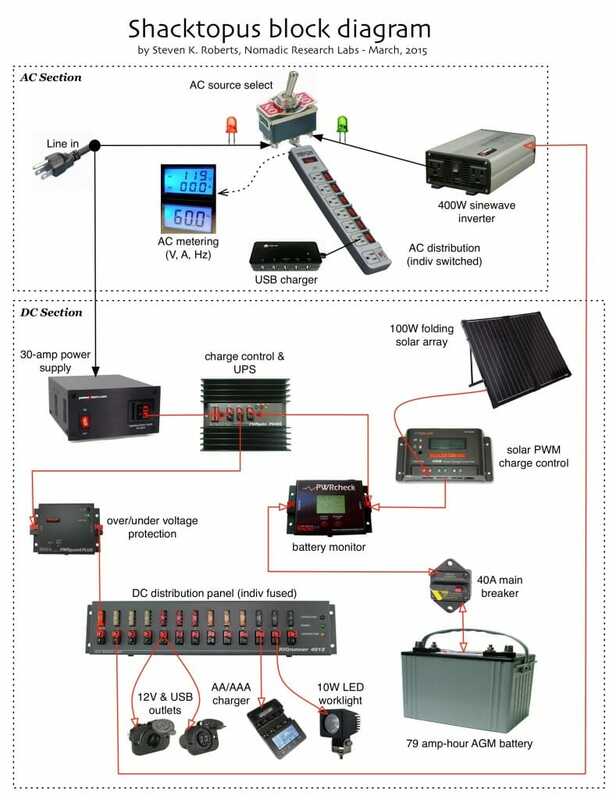 On a voyaging sailboat, stable power goes with the territory: a huge battery bank charged by isolated shore cable and solar panels, diesel genset with a ton of fuel, fine-grained switching, sine wave inverter, clear displays, circuit protection, and reliable design. I have grown used to staring at this console and having an accurate sense of my system’s current condition. I didn’t think about this while moving off of Nomadness so she would show well; I just loaded my room in town with computers and electronics — digital piano, mixer, rack amp, video and comm gear, and even a 12-volt power supply for nautical goodies like the stereo. But when I brought home my ham rig to bounce a few APRS packets off the ISS, something started to bother me. So, I have all this nifty technology for independence and communications, including an insanely dense pack of gizmology that I haul around on my bad back… yet I am ultimately dependent on the power grid. If that fails, I have about two days worth of charged Lithium Ion batteries for personal electronics, but if I want more, then I have to trundle down to the boat and plug in. I realized that I miss owning a floating utility company, and recalled weeks without electricity in Santa Cruz after the epic 1989 quake… depending on the bike’s solar power system to run the essentials. From there, well, you know how geek obsession works. I kept refining the specs and began to think of it as the hub of my electrical life: easy mobility, fast charging from the wall, folding solar array with controller, sine wave inverter, AC and DC panels, USB charge ports, AA battery dock, and local displays. Since it would be the one thing in my personal space that is always on, it is a perfect substrate for data collection, a camera, and a server to graphically display history on a browser and push events to my watch. I didn’t find a suitable gadget to buy, or I would have done so and moved on… I am busy enough with the book and other projects. But now that it’s done, I find it to be a highly useful power tool, and one of these days I’ll write an eBook of plans for folks who want to build one. Like most of my projects, this avoids wheel-reinvention except where necessary. It’s a dense packaging and integration job involving carefully researched products, augmented by a few unusual features and overlaid with computational goodness (like BEHEMOTH). That last item was a key feature for my application, as it fits under my lab/office desk… but the system scales such that one could use a heavy-duty welded industrial cart and carry two Group 27 batteries (220 amp-hours versus my 79). The current mechanical design is adequate for my needs, but I wouldn’t want to galumph with it down bumpy roads! More robust folding carts are available. The white panels are HDPE, an easy-to-machine material that I usually acquire in the form of King Starboard (as in the boat’s power console project). For this job, I just picked up a couple of cutting boards from Amazon — not as smooth and uniform as the good marine stuff, but convenient. 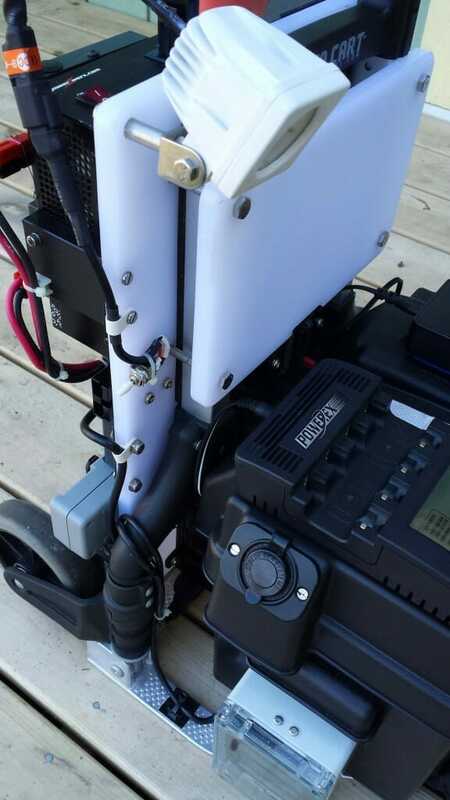 As you can see in the photos, I based the DC circuitry on a product family from West Mountain Radio, well-known in the amateur radio community for modules that make it easy to construct an uninterruptible power supply or reliable 12-volt system for home stations and repeaters. I’ll go into the various design trade-offs in a more detailed post about the project, but their approach to RFI minimization is effective (with high-side monitoring and clean change-over between line and battery, since the PWRgate charge controller is wrapped around a big Schottky diode-OR architecture). 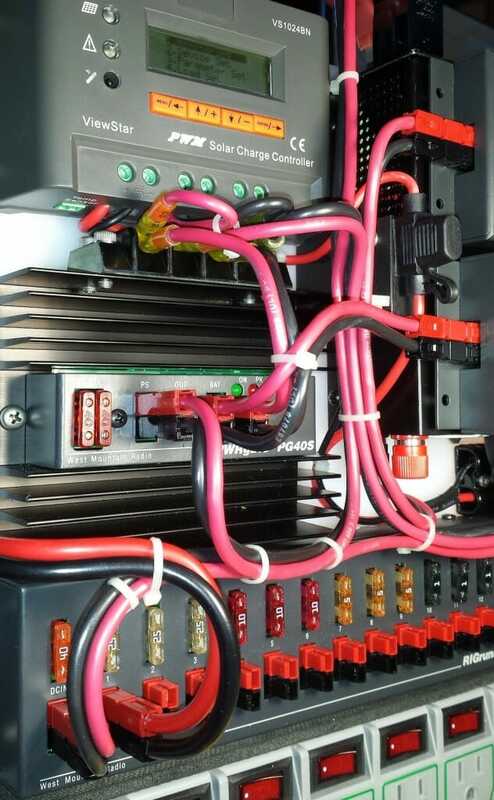 They make good use of Anderson Powerpole connectors, which integrate well into a wiring harness and are a ham radio standard. All the ones in the photos are rated at 45 amps, and I used a proper crimper to get uniform terminations. The solar array I used for this is the Renogy 100-watt “suitcase” model, which folds down to about 20×28 inches and comes in a nice protective case with a strong handle. To minimize stray power electronics and cables cluttering my life, the machine includes three independent USB charging sources totaling 8 outputs, AC metering, a “cigarette lighter” 12-volt outlet, spade terminals on the battery, a utility board with barrier strips, a cable for charging the network slice of my backpack, and a charger for AA and AAA batteries. I am now turning my attention to the smart overlay. The intent here is to take advantage of a stable power environment to support a core set of data collection tools. In the planned Nomadness implementation, this involved hundreds of data points reflecting the status of every subsystem from bow to stern… all time-stamped and collected into a database server with various clients including browsers, security and watch code, maintenance schedulers, remote telemetry tuned to available bandwidth, and so on. But in the casual environment of a hand truck parked in my workspace, it is a much simpler problem… though still based on the same tools. The micro will slurp data out of the metering systems, log temperatures with DS18B20 sensors (ambient, battery, charger heat sink, and electronics enclosure), keep an eye on the room with the Raspberry Pi camera and a PIR motion sensor, monitor environmental parameters (humidity, pressure, light, gases, radiation), and provide for easy connection of other application-specific devices via slaved Arduinos or simple sensors. 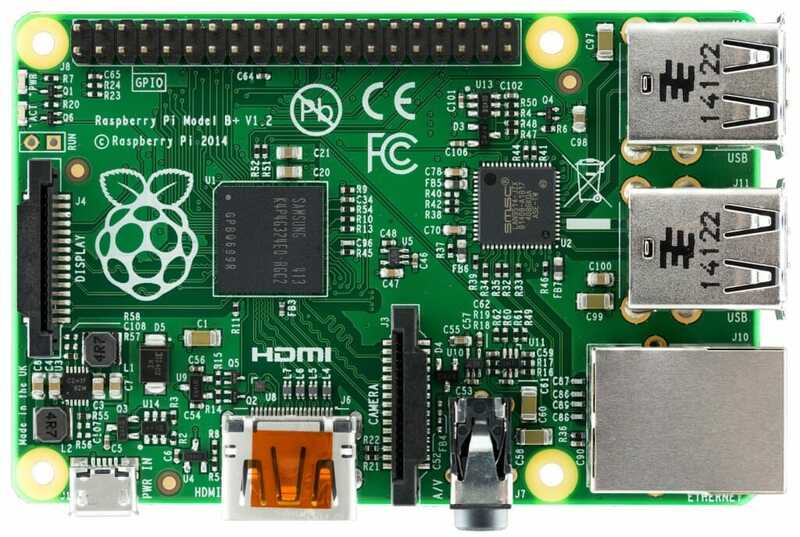 The Pi on the cart has WiFi, Bluetooth, and HDMI, so it feels like another computer; a little NFC tag can tell my phone to connect and turn itself into a convenient console, and before it’s all done I expect to push notifications to my Pebble watch. This should yield a set of tools that scale well to the next boat… or whatever I end up doing in this looming post-Nomadness epoch. It’s a development system that doubles as a portable power station covered in blinkies. Is that a good approximation of geek nirvana, or what? I have been enjoying this project… probably because it is finite in scope, unlike my usual open-ended concepts that evolve more quickly than my ability to keep up with fabrication and coding. More fun ahead! I’m really looking forward to reading this in detail. 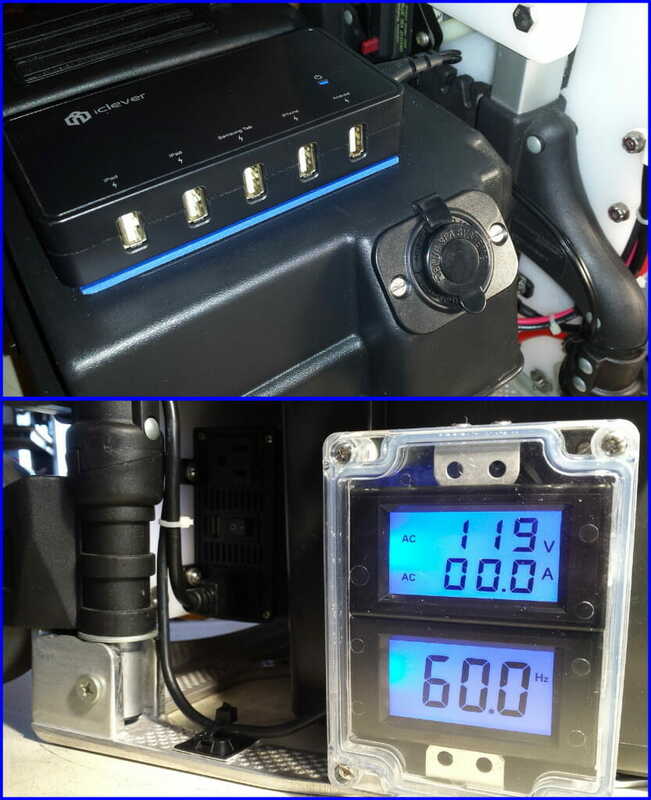 I’ve got a good charging set-up in my VW camper now, but no solar yet, and I’d like to add some instrumentation. Your work here may help me do that! Just wanted to throw out a quick word of appreciation to you. I hit upon this page after some semi-random wandering and just “had” to check out your power beast write up out of some “Hey that looks kind of cool.” kind of thinking. 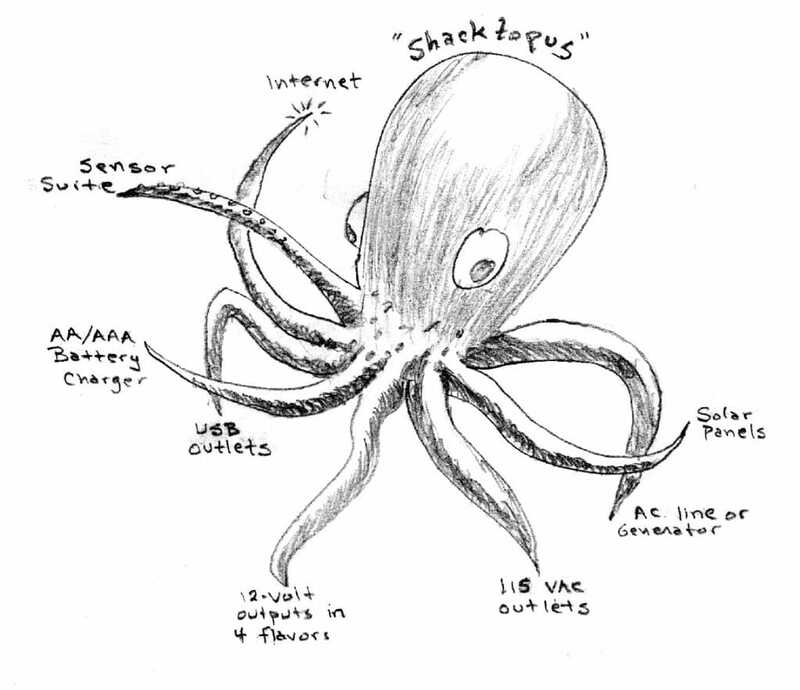 I PERSONALLY am not a electrical intellectual but I do have an appreciation for those who are.. What I really want to comment about though is your Shacktopus Block Diagram picture, which has to be one of the most comprehensable descriptions of an working AC/DC electrical system I have so far come across. Clearly showing how everything goes together for those of us who sometimes think of ourselves as morons when we even glance at an electrical diagram…. lol… I like to think of myself as a relatively intelligent guy but electrical has just never really been one of those things that “clicked”. Your diagram pic though brought out an instant “Oh. I get it.”. While I may never build your little portable monster, when it comes right down to it it’s basically a full on boat electrical system writ small that even an electrical dumbass like myself is able to understand..